Named the Vietnam Veterans Memorial Highway, Interstate 495 forms an eastern bypass of Wilmington. The six lane freeway also serves freight traffic to the Port of Wilmington and industrial areas in east Wilmington and Edgemoor. Commuter interests to Wilmington use I-495 as well from I-95 into south Wilmington and between 12th Street and Claymont. Implemented in 2004, variable speed limits are used along the route. Interstate 495 traverses wetland areas along the Christina River through industrial areas of south Wilmington near the Port. Spanning the Christina on a high-level bridge, the freeway continues to Edgemoor. North from there, I-495 runs along side the Delaware River, U.S. 13 (Governor Printz Boulevard), the AMTRAK Northeast Corridor and a Norfolk Southern Railroad line to Claymont. 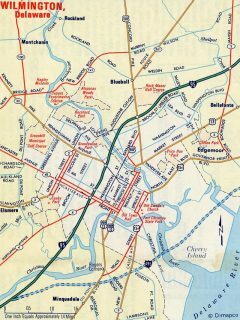 Opened to traffic in 1978, Interstate 495 was renumbered as the mainline for Interstate 95 in 1979 while the former route through Wilmington was changed to I-895. This designation switch coincided with major reconstruction along the Wilmington Viaduct and Adams-Jackson Freeway sections of I-95. AASHTO approved the renumbering of I-495 to I-95 on June 26, 1979 and the renumbering back to I-495 on November 14, 1980. Interstate 495 under construction in 1970. U.S. 202 was truncated from Farnhurst to north Wilmington this year while U.S. 13 was redesignated along what was U.S. 13 Alternate. The Wilmington bypass originally included four interchanges. They were located at U.S. 13 (Dupont Highway), Delaware 9A (Terminal Avenue), 12th Street and U.S. 13 (Philadelphia Pike). The Edgemoor interchange was planned in 1985 and completed by 1989. The new ramps linked I-495 with U.S. 13 (Governor Printz Boulevard) and Delaware 3 (Edgemoor Road) in an industrial area along the Delaware River. Interstate 95 between U.S. 202 (Concord Pike) and I-495 at Claymont underwent major reconstruction in 2000. Opened to traffic in 1968, the original concrete deteriorated throughout the 1990s, leading to the six-month project. While underway, one direction of I-95 was shut down for a three month period so that crews could rubblize the existing concrete and overlay it with a new type of asphalt material. Through traffic was diverted onto I-495. As a result, Interstate 495 improvements included expansion of the northern and southern interchange lanes available to and from I-95 and new access from I-495 south to U.S. 13 north and from U.S. 13 south to I-495 north at Exit 1. This work was completed in June 2000. Signs at the south end of I-495 were also replaced and reassurance shields were installed all along Interstate 495. The was significant because very few markers were posted for I-495 along the mainline prior to 2000. Preceding the I-95 reconstruction, a late 1999 proposal advocated renumbering Interstate 495 as Interstate 95. 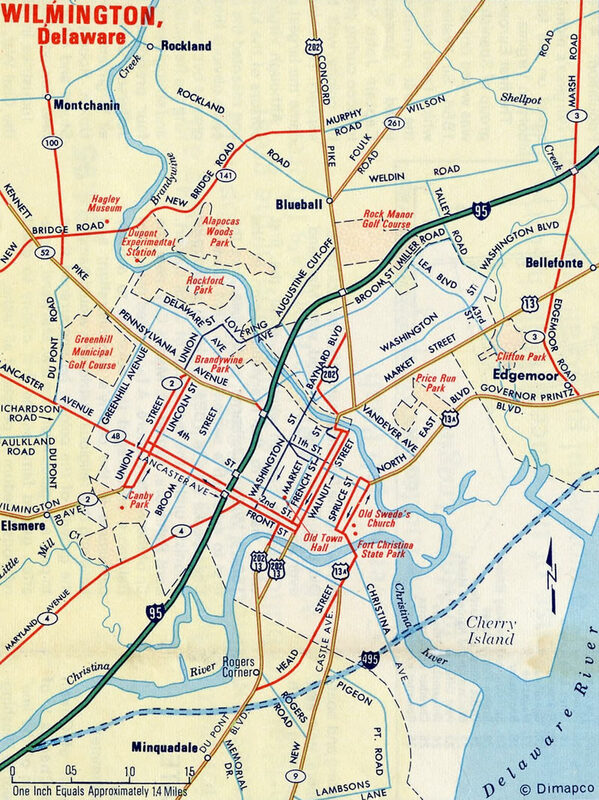 The plan outlined renumbering I-95 through Wilmington as either Business Loop I-95 or Interstate 195. It never came to fruition due to objections from Wilmington city leaders on losing I-95. Interstate 495 curves away from the adjacent Delaware River and the AMTRAK Northeast Corridor and approaches both U.S. 13 (Philadelphia Pike) and Interstate 95 at Claymont. Photo taken 12/23/17. Interstate 495 parallels U.S. 13 from Edgemoor northward to Claymont. The US highway continues north from Exit 5 to Marcus Hook and Chichester, Pennsylvania as a local route serving industrial areas along the Delaware River. Photo taken 12/23/17. The freeway ends 0.75 miles beyond Exit 5 at a wye interchange with Interstate 95 north. Photo taken 12/19/16. Pull through signs for Interstate 495 north ahead of U.S. 13 (Philadelphia Pike) referenced I-95. Truss sign bridges for Exit 5 were replaced with monotubes in 2017. Photo taken 12/22/08. Exit 5 departed I-495 north for U.S. 13 (Philadelphia Pike) and Claymont. Photo taken 12/22/08. Travelers along I-495 north merge onto Interstate 95 at the Pennsylvania state line. I-95 continues five miles to Chester. Photo taken 12/22/08. The first reference for Interstate 495 along I-95 south appears on this interchange sequence sign posted two miles out at a pedestrian overpass near Trainer. This sign was damaged by 2009. Photo taken 12/21/16. Three lanes of Interstate 95 advance south from the Blueball Avenue overpass toward the wye interchange (Exit 11) with I-495. The “City/Port of” overlay on the sign was added for the I-95 reconstruction project in 2000. When Interstate 95 southbound was closed, all traffic was redirected along I-495, including traffic destined for the city of Wilmington. Photo taken 10/05/14. A second diagrammatic overhead precedes the partition of Interstates 95 and 495 at the Delaware state line. Local and Thru Traffic overlays here remained from the 2000 reconstruction of I-95 between I-495 and U.S. 202. I-495 carries the bulk of traffic headed south to Baltimore with six overall lanes while I-95 reduces to four lanes through the Brandywine Hundred communities leading into Wilmington. Photo taken 12/21/16. An interchange sequence sign appears just north of the PA 491 (Naamans Creek Road) underpass for Interstate 495 south. The forthcoming diamond interchange (Exit 6 on I-495 south / Exit 11 on I-95 north) with Naamans Road (SR 92) surrounds the freeway split. Photo taken 10/05/14. A weathered, original I-495 shield directs motorists to the right as I-95 crosses the West Branch of Naamans Creek. Photo taken 07/27/07. Still just inside Pennsylvania, Interstate 495 branches southeast from I-95 south to Claymont. The two routes reconvene along I-95 in 11.2 miles. Photo taken 12/21/16. Interstate 495 veers west from Southbridge in Wilmington toward U.S. 13 (Dupont Highway) by Minquadale and Interstates 95 and 295 ahead of Newport. Photo taken 12/20/17. Three lanes continue west along Interstate 495 toward the wye interchange with I-95 south while a lane drop occurs at Exit 1 for U.S. 13 (Dupont Highway) south toward New Castle and north back into Wilmington. Photo taken 12/21/16. The south end of I-495 defaults motorists onto the left side of Interstate 95 preceding its merge with I-295 south. A flyover departs from the right, allowing commuter traffic to reach the collector distributor roadway for U.S. 202 south and Delaware 141 (Newport Freeway). Photo taken 12/21/16. Traffic to Exit 5 and Delaware 141 parts ways with Interstate 495 south. A left exit follows onto I-295 north leading east toward New Castle and the Delaware Memorial Bridge. There is no access to I-95 north otherwise. Photo taken 12/21/16. This sign bridge was replaced by a monotube assembly in 2017. A new overhead here was the first to reference the ramp for I-295 as Exit 0. Photo taken 08/18/05. Southbound Interstate 495 partitions with ramps for I-295 north to the Delaware Memorial Bridge and SR 141 to Newport and New Castle. Photo taken 08/18/05. Overheads at the south end of Interstate 495 were carbon copied by 2012. Photo taken 08/18/05. Interstate 95 continues beyond I-295 and Newport toward Newark and the John F. Kennedy Memorial Highway toll road west to Baltimore, Maryland. Photo taken 03/27/04. The first in a series of sign bridges for I-295 and I-495 appears along Interstate 95 north at the SR 58 (Churchmans Road) overpass. I-95 (Delaware Turnpike) maintains eight overall lanes from the Newark Toll Plaza eastward to SR 1 & 7 (Exit 4) and ten lanes across Christina Marsh to the split with I-295. Photo taken 10/05/14. The right two lanes of I-95 north separate onto Interstate 295, which follows the Delaware Memorial Bridge across the Delaware River into New Jersey. Just beyond the twin suspension bridges, I-295 turns north toward Camden at the beginning of the New Jersey Turnpike. I-495 splits from I-95 north at a succeeding wye interchange. Photo taken 12/18/16. The roadways of Interstate 95 separate as the freeway enters the sprawling interchange complex with U.S. 202 south, Delaware 141 (Newport Freeway), I-295 and I-495. Four lanes stay advance northward along I-95 toward Wilmington while two lanes depart for New Jersey and the adjacent loop ramp to Newport. Photo taken 12/18/16. Interstate 295 begins at this gore point along Interstate 95 northbound. Widening of the freeway between 2007-08 expanded the split to add an additional northbound lane for Interstates 95 & 495. The busy junction regularly sees traffic counts over 150,000 per day. During peak travel times, such as holidays and summer weekends, it is not uncommon for I-295 traffic congestion to stretch two to three miles westward. Photo taken 12/18/16. U.S. 202 combines with I-95 north from SR 141 as the freeway parallels the initial stretch of Interstate 295. Beyond the SR 141 northbound overpass, I-95 north curves northeast toward the split with Interstate 495. Photo taken 12/18/16. When Interstate 95 was reconstructed north of Wilmington in 2000, a third lane was added for Interstate 495 north. 2007-08 construction expanded the split even further with an additional lane for I-95 north to Wilmington. Clearview font based signs were installed here in 2008. Photo taken 12/20/17. Interstate 495 branches to the northeast from I-95 & U.S. 202 north toward the Port of Wilmington and Edgemoor. The freeway carries the bulk of through traffic bound for Philadelphia as speed limits are ten miles per hour higher than those set along I-95. Photo taken 12/20/17. Photos covering older lane and sign configurations for the Interstates 95/495 split are posted on the Interstate 95 North – Delaware Archive page on AARoads. Interstate 295 leaves the Farnhurst Interchange with U.S. 13 & 40 and approaches the junction with I-495 north, I-95 and Delaware 141. The interchange with U.S. 13 (DuPont Highway) opened in 1951; the freeway west to Interstate 95 opened in 1963. Photo taken 10/03/14. A ramp for the northbound beginning of I-495 departs Interstate 295 south. I-495 constitutes an 11-mile long bypass of Wilmington for interests north to Claymont and Delaware County, Pennsylvania. Photo taken 10/03/14. “I-495 repairs might continue through spring.” The News Journal, September 25, 1992. “Contractor facing penalties.” The News Journal, February 17, 1993. “Expect further delay on I-495 and woes down the road on I-95.” The News Journal, May 23, 1993. “Nightmares of the Week – Fast times on I-495.” The News Journal, October 23, 1994. “Upper East Side residents fight I-495 connector.” The Wilmington News Journal, April 14, 1982. “All I-495 lanes open.” The News Journal (DE), August 25, 2014. Page updated November 20, 2018.